With honesty of team members, we have attained a prominent position of this realm by providing the best quality range of Shahnaz Husain Facial Kit. Shahnaz Husain Diamond Mini Diamond Kit contains - Skin Nourishing Cream (10 g) + Diamond Exfoliating Scrub (10 g) + Diamond Rehydrant Lotion (10 g) + Diamond Skin Rejuvenating Mask (10 g). 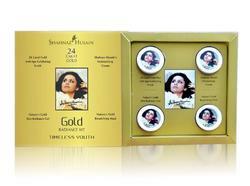 Shahnaz Gold facial kits services at home.